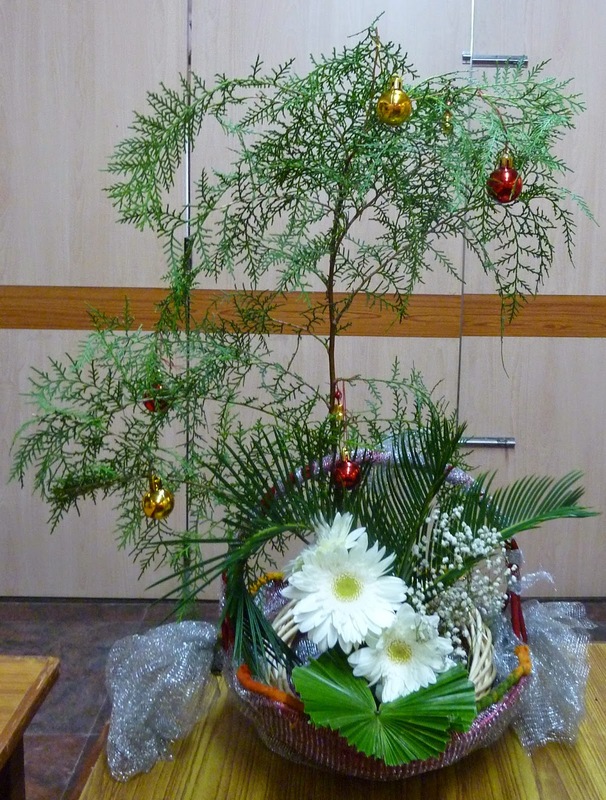 Our last meeting of the year was a Christmas theme with a delightful demonstration by sensei Dalley. 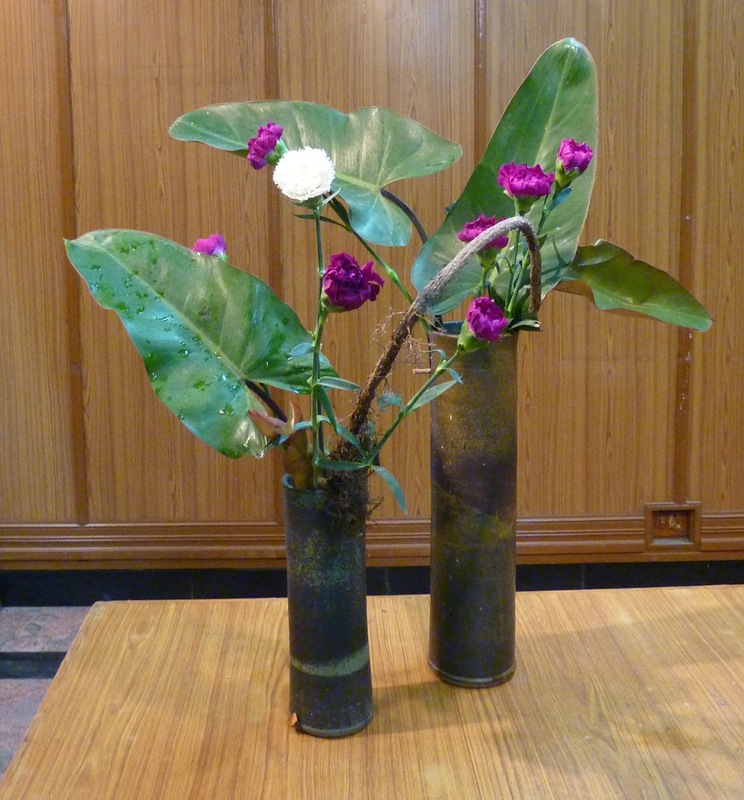 She created lovely arrangements with her usual flair and colour sense, and all the members enjoyed the demonstration. 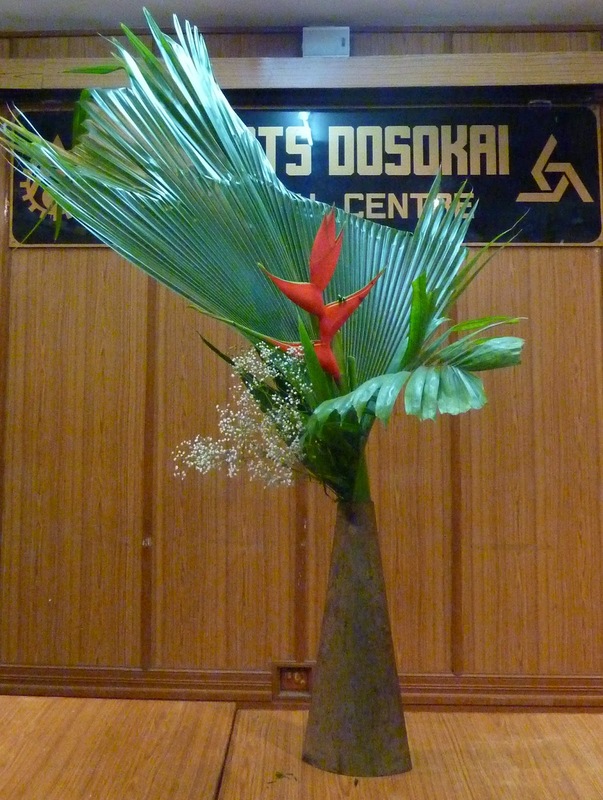 Her first arrangement for the season was this creation, with a large palm leaf adding drama, and the strelitzia adding Christmas cheer. Moving on to her final piece. 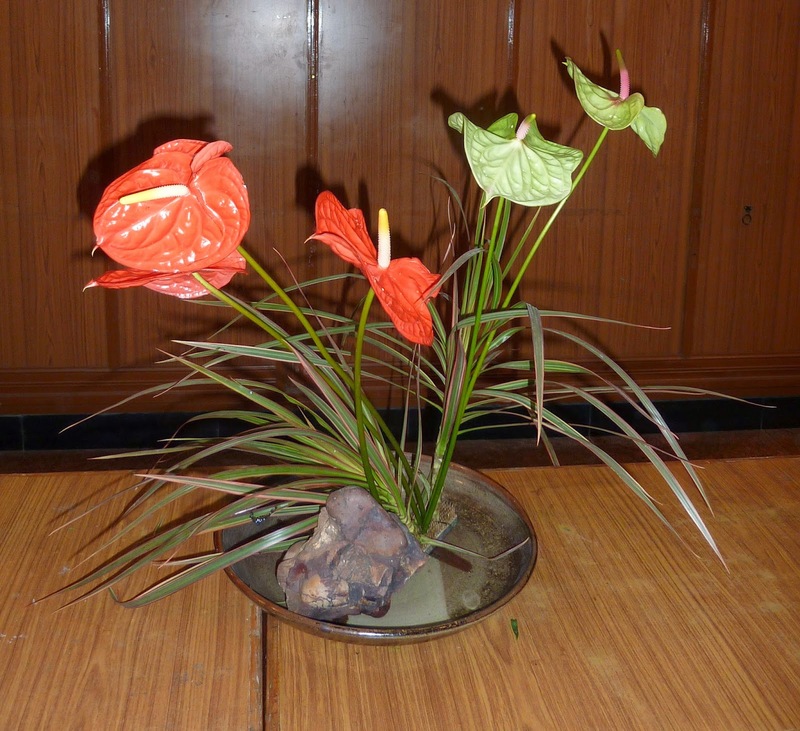 A dash of Christmas colours with large showy anthuriums. Members then displayed their own creations. 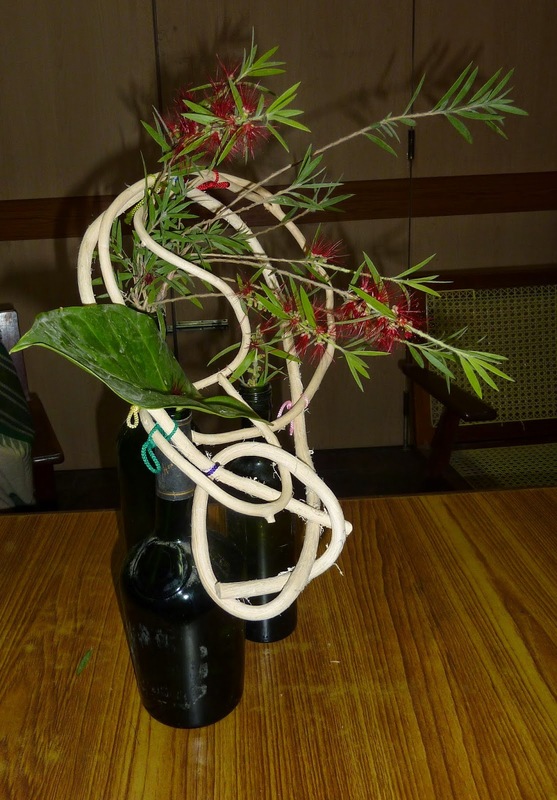 Sensei Molly found Bottlebrush in bloom to add that festive look to her arrangement with wine bottles. 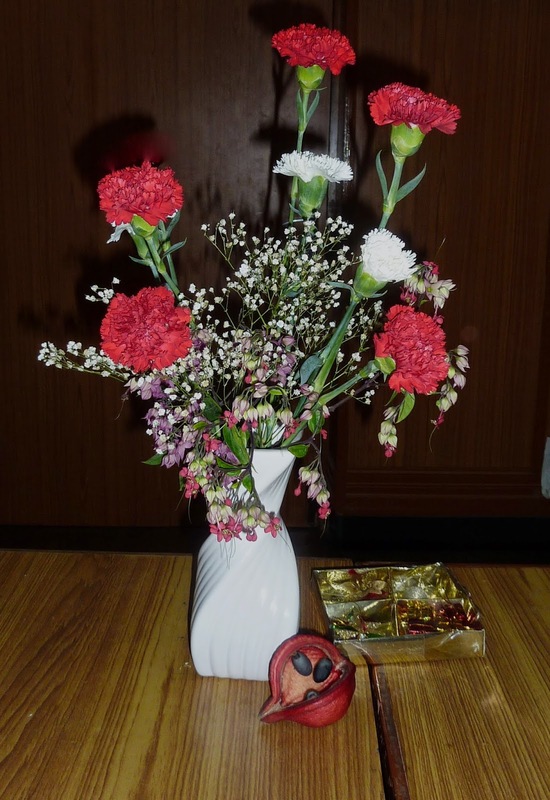 Prerana accessorised her arrangement to good dramatic effect. Trishala recreated a Christmas tree. 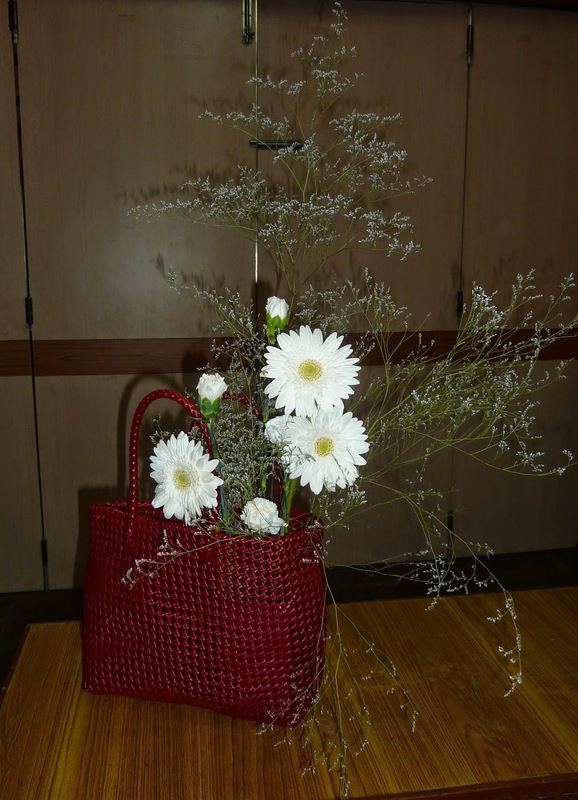 Chelvi complemented her bright red basket with large white jerberas, softened by the everlasting flowers. 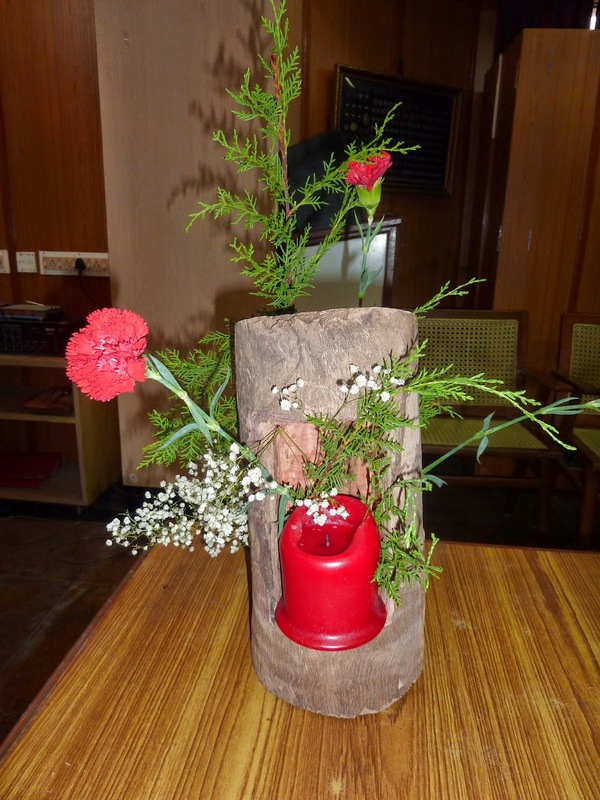 Student Bhuvana worked with a red candle for that Christmas feel, with driftwood. 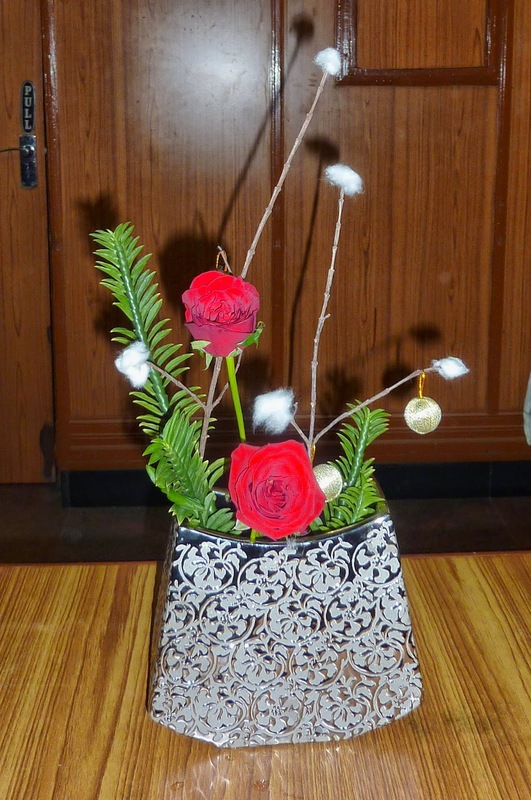 Divya worked with roses, and the cotton on sticks added to the festive spirit. 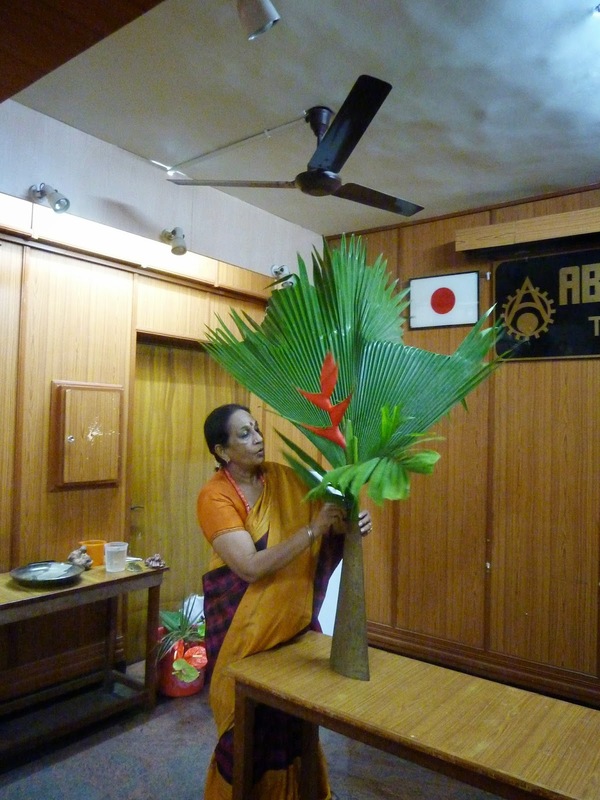 Kalpana highlighted the long slender line of the jerbera beautifully. 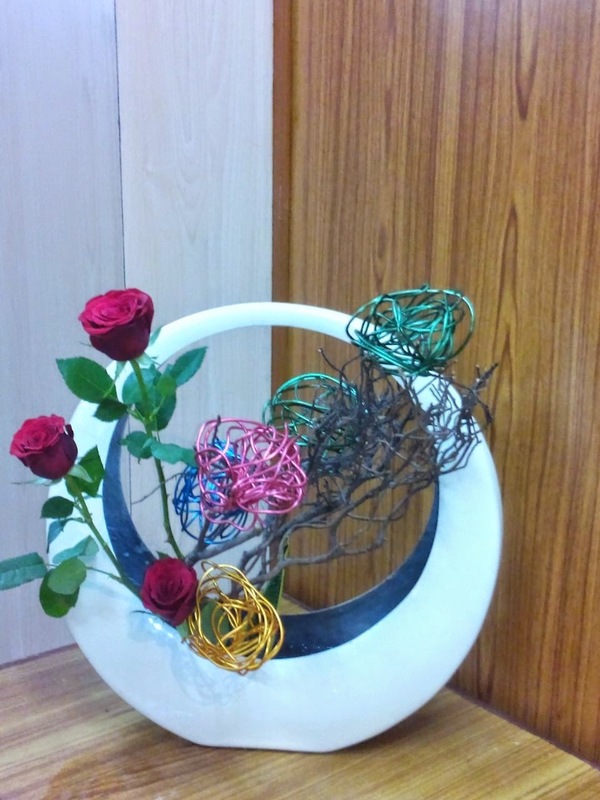 Sensei Vaishali also used roses, and her trademark coloured wires, bunched up like christmas decorations. 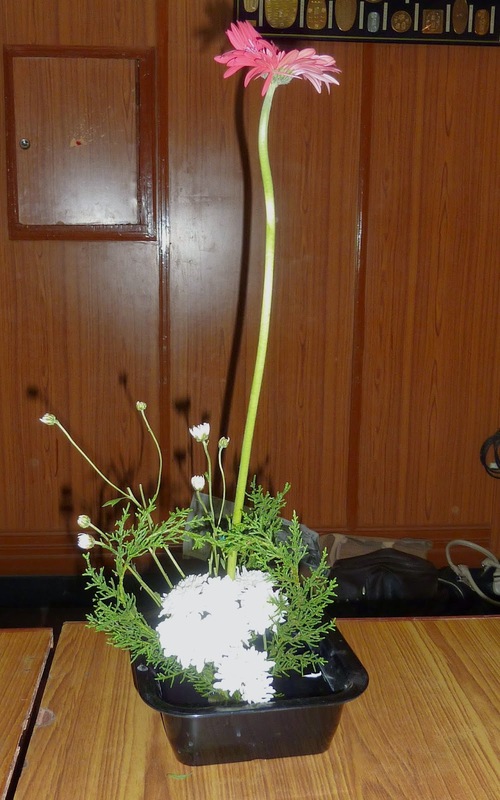 Janaki showcased her lovely vase with a combination of materials that included clearophytum and a hint of antigonon. the sseds of the Java Olive added to the season's look! We wound up our activities for the year. 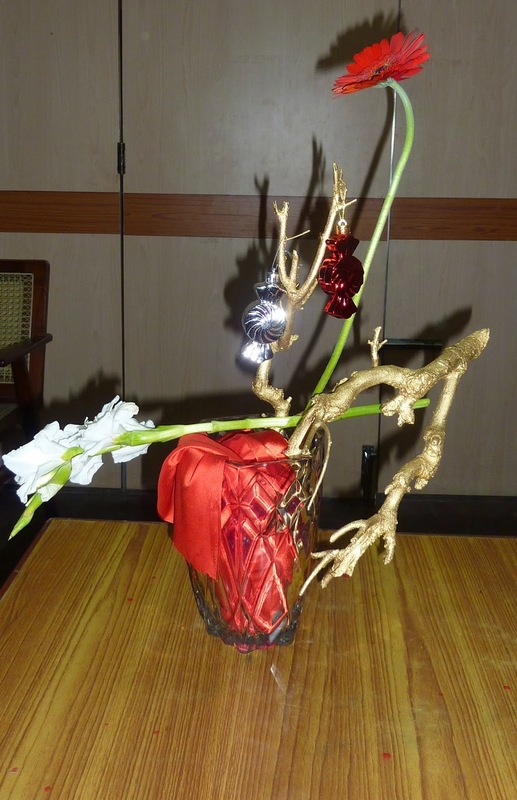 The Study Group looks forward to a 2015 filled with creativity, camaraderie, and flowers of course. out by nature on driftwood. the same sensibilities that the Japanese art is known for.